Linea muffin pan with baking cups. Stir almond flour, salt, baking soda, and spices in a large bowl. Mix butter, honey, lemon juice, and eggs in a medium bowl. Whisk until well mixed. Stir wet ingredient into the dry and stir until combined. Pour batter into baking cups so they are about 1/2 to 2/3’s full. Bake for 20 – 25 minutes until toothpick inserted in center comes out clean. Cool before using for shortcakes. Slice strawberries – I would say about a cup of sliced strawberries per person. Place strawberries in a bowl and stir with a little lemon juice – about a 1/4 tsp per cup of strawberries. Allow to sit while you prepare the whipping cream. Beat whipping cream yogurt with a little honey to taste. Beat until it is light and fluffy. It will come out pretty light, especially if you are using yogurt made with 100% whipping cream. I would say about a 1/2 cup (before whipping) per person with about a 1/2 tsp of honey (I didn’t really measure this part, I just took what I thought I needed). Place one half on a plate or in a bowl. Top with sliced strawberries and a spoonful of the whipped yogurt. Add another layer of strawberries and yogurt. 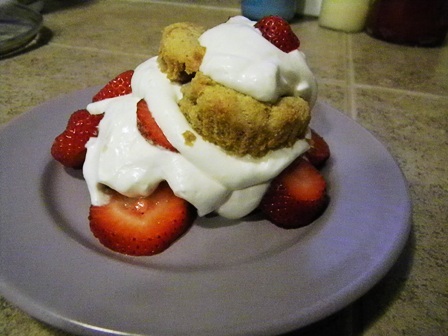 Top with other half of shortcake. Add a little more whipped yogurt and a couple of strawberries for garnish. This recipe being shared on Slightly Indulgent Tuesdays. oh my gosh that looks so good! the perfect summer treat! I just tried these yesterday, and they were great. My son, who is 16 and on the diet for his UC newly diagnosed in April, had two servings with whipped coconut cream! The whole family ate and enjoyed them for a wonderful end to my oldest’s last family dinner before going off to college in a couple of days 🙁 Thank you for sweetening that for all of us.